Serena Williams on the Cover of Vogue April 2015. Fresh off her nineteenth Grand Slam, Serena Williams talks to Rebecca Johnson about fitness, forgiveness, and her friendship with tennis rival Caroline Wozniacki. Serena broke the cover news in a fit-tingly, fabulous way: by reading her Vogue issue while showing off her toned body in a skimpy bikini. 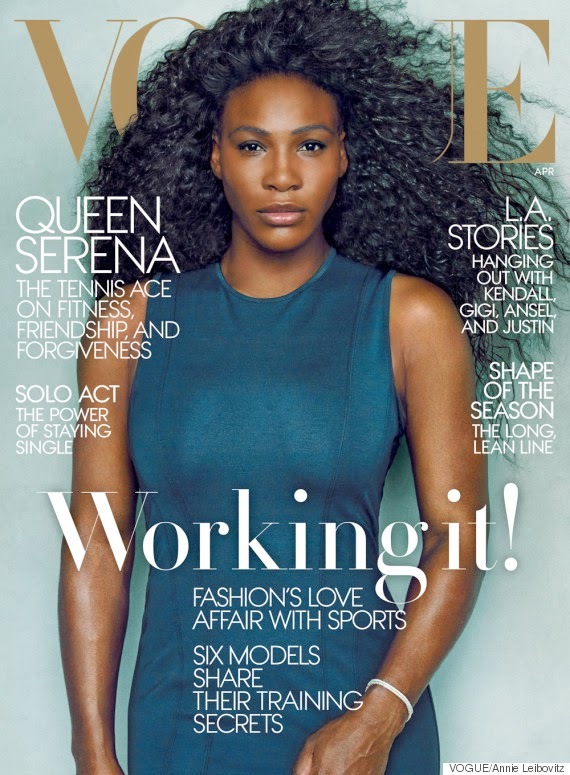 Serena Williams graces the cover of Vogue magazine for the second time. The tennis superstar rocks a simple blue Rag & Bone dress with a natural looking makeup and hair. The annual SHAPE edition for April 2015 is just in time for the Spring/Summer Season. In her cover story, Serena sits alongside fellow tennis champ and best friend Caroline Wozniacki (also featured in the issue) as they talk about friendship and forgiveness. Read the full story at Vogue.